Маркирани оферти за TP-Link TL-SG105 Как са подбрани? 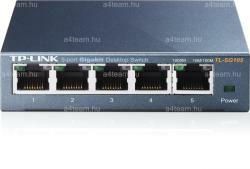 When a computer or network equipment is off, the corresponding port of a traditional switch will continue to consume considerable amounts f power. The TL-SG105 can automatically detect the link status of each port and reduce the power consumption of ports that are idle, resulting in up to an 65% reduction in power use.